Barwheys is a stunning luxury farm complex to rent on an exclusive use basis in the rolling green hills of Ayrshire. The farm has four newly renovated buildings built around a courtyard – three providing beautiful en-suite residential accommodation and one ancient barn converted into a magnificent games hall and chill out zone. Barwheys sleeps up to 16 people in 8 beautiful bedrooms each with en suite facilities. Two double storey halls enable the whole party to cook, eat and play together and numerous sitting and dining areas inside and out provide space for our guests to relax in. Wi-Fi is available throughout the farm and there are five HD TVs of different sizes. The hot water and central heating is provided by a biomass boiler which burns woodchip from local woods. 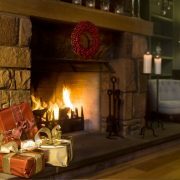 If you are looking for a hidden retreat nestled away in the West of Scotland for a festive family holiday, friends gathering , a private celebration or Christmas or New Year party, Barwheys is the place for you. Barwheys is always let exclusively to private groups looking for a large and luxurious self catering holiday venue in which to stay in style and privacy. With its stunning dining hall, comfortable sitting rooms, Granary games room, state of the art kitchens and 8 en-suite bedrooms Barwheys can accommodate groups of up to 16 guests in the highest standards of comfort. 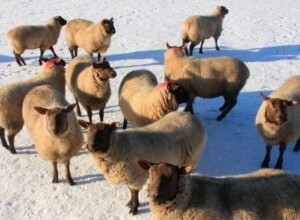 Barwheys sits beside a working farm and so there is always something to see. Explore the woodland walks, or just sit on one of the window seats watching the countryside. You may see hares, deer, buzzards, woodpeckers, sparrow hawks or flocks of redwings. Barwheys is a golf lovers heaven with dozens of exceptional courses for all levels of skill within 10 to 40 minutes drive. 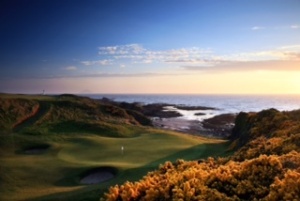 The golf courses are of a very high standard, both for quality and scenery and two of the most famous British Open Golf Championship courses in the world are a short drive away – the Ailsa Course, Turnberry and Royal Troon, host to the 2016 Open. Barwheys has plenty of space to store clubs and dry clothes to make your trip as easy as possible. If you are looking for a hidden retreat nestled away in the West of Scotland for a private friends gathering or family celebration Barwheys is the place for you. Sleeping 16 in 8 stylish bedrooms Barwheys enables you and your guests to relax and unwind. 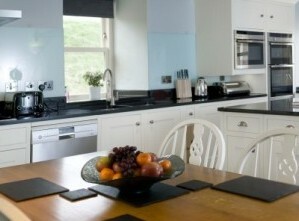 We can organise a chef to look after you or you might enjoy preparing your own meals in the state-of-the-art kitchens . 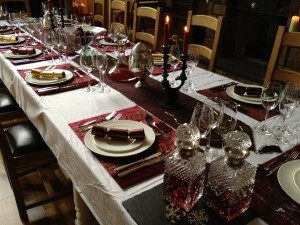 The large dining table can seat 16 but you might like to put up a marquee on the flat lawn for a bigger party. Either way you can be guaranteed privacy to enjoy yourselves in your countryside retreat. 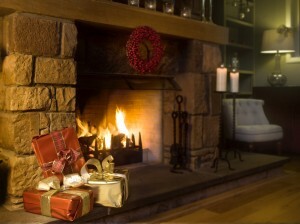 Barwheys is the ideal place to celebrate Christmas and welcome in the New Year in true Scottish style. Cosy lounges with roaring fires, the grand dining hall and the magnificent games room with media centre enable the whole party to celebrate together. Rolling countryside and woodland walks on the doorstep enable you to walk off any festive indulgences and enjoy the bright winter weather. 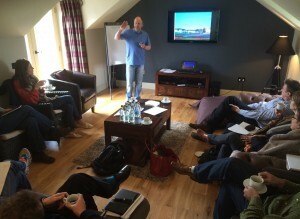 Barwheys is ideally suited for small, private off-site corporate events. The galleried dining room is perfect for inspiring formal sessions of up to 20 people and the galleries and sitting rooms are perfect for smaller break-out sessions. Large flat LED screens and wi-fi are available for wireless presentations . You will have exclusive use of Barwheys and so will have total privacy for sensitive meetings. 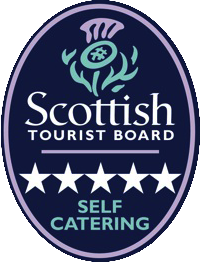 We can organise chefs to look after you and transport to bring you here. Once the formal sessions are over you can play golf at Turnberry or Troon, get out and about in the countryside or just relax in front of a fire.